Forget the shops and restaurants. At El Tesoro, I’d rather sit on the terrace, drink a coffee and enjoy the view of the valley. Writer’s note: This is the eighth story in a monthly series on the “best of” Medellín and the surrounding area. To read the seventh story, click here. 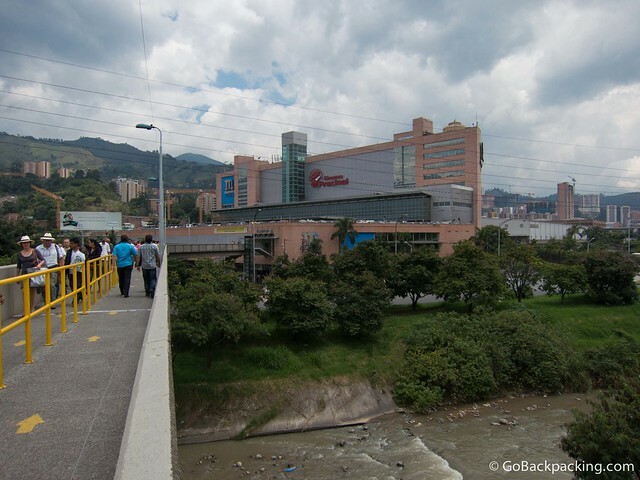 Something impossible to miss in Medellín is the shopping malls. There are some nice ones. It’s in one of the city’s wealthiest areas and it fits right in. El Tesoro has everything you could want: great restaurants such as Mis Carnes; great stores such as Adidas; and a great view from its northern terrace. You can see a movie if you’d like too. Just remember to bring enough money if you plan to shop. It’s not cheap. The center of Centro Comercial Oviedo. Centro Comercial Oviedo is like El Tesoro, a place with great stores and restaurants, and a movie theater too. But instead of a view, it has a large tree in the middle. I’m guessing there are people who like this mall better because of the location as well. It’s right off Avenida Poblado, on the Milla de Oro, the Golden Mile, a business district that generates a lot of Medellín’s wealth. There is another shopping option nearby, which I’ll get to later, but this is the best one in the area. In Belén, people flock to Los Molinos. I used to live two blocks from Centro Comercial Los Molinos and visited a handful of times. It’s where I would go to the movies. Sometimes, I would go grocery shopping at the Exito, in the south section of the mall. Other times, I’d get ice cream from Crepes & Waffles. Once, I bought a shirt from Arturo Calle, possibly my favorite clothing store in Colombia. In fact, it’s the only mall store from which I’ve ever bought an article of clothing. Just south of Centro Comercial Oviedo and across Avenida Poblado, you’ll find Centro Comercial Santa Fé. I laugh every time I pass the Dunkin’ Donuts here. I once lived in Rhode Island for a summer, and Dunkin’ Donuts is everywhere, so this reminds me of those three months in 2001. A lot of people go here to eat at Sushi Light, especially on Tuesdays, 2-for-1 sushi night. Get there early if you want a seat, by 6 p.m.
Another good reason to go is the currency exchange office on the third floor. It’s always better to exchange or withdraw money in malls so why not here? Mayorca might be the most economical of the malls. The first time I went, I tagged along with my British friend John, who was looking for slacks. I don’t remember the exact cost, but it was a good price. While I was there, I also bought a little stuffed tiger from Pepe Ganga, a gift for my friend Neto, whose wife had just had a baby boy, Cristobal. Perhaps the best thing about this Sabaneta mall, though, is the location: right next to the Itagüí metro station. It’s hard enough to get me to go to the mall, but convenience helps. I went to all but the last one. I also can list where the cruising areas of all those shopping centers are. I recommend Santafé, which is the largest mall in Medellín with the biggest selection of shops. I also recommend Mayorca mall, which opened a major expansion late last year. Many of the shops in Mayorca stores will also typically have better prices than shops in the Santafé mall. You are missing a few large shopping malls in your list including Premium Plaza that opened in 2007 with over 300 shops and is a nicer mall than Mayorca. Another one I prefer over Mayorca is Puerta Del Norte located at metro station Niquía that opened in 2008 with about 250 shops including an Exito and Homecenter that’s another very nice mall. I also like Unicentro even though its an older mall that opened in 1991 as I used to live near this mall and I went to it often. Unicentro has over 200 shops, an Exito, movie theater and cheap money exchanges (usually close to the xe.com exchange rate) and is located next door to Universidad Pontificia Bolivariana. I personally prefer the malls away from Poblado like Los Molinos and Puerta Del Norte, which are usually much busier with more women walking around than the malls in Poblado – not to mention being far enough away from Poblado that you rarely run into gringos. Oviedo in Pobaldo was originally built in 1979 and even after some upgrades in 2003 is starting to show some age with some empty spots I started to see after the huge Santafé opened in 2010 nearby. I counted 4 empty spots last month in Oviedo on levels near the food court. Poblado looks to be overbuilt with shopping malls with the new Centro Comercial Rio Sur across the street from Oviedo struggling to find tenants and is still full of many empty spots. And the cheapest clothes in Medellín can be found in El Centro, including the large Centro Comercial Palacio with over 200 small shops. I’m guessing Ryan may have included a few more of these if he didn’t limit his list to 5 malls. Premium Plaza is the one I use almost daily, both for groceries at Carrefour and Bodytech (though I may change to Forma when I get back). I’ve been to Puerta del Norte in Niquia as well, but only to meet people. I wouldn’t recommend anyone go out of their way to use that mall unless they’re curious. I don’t think it can compare in design or shopping to Santa Fe or Oviedo. Agree Avenida Poblado features a few too many malls at this point, but La Strada and Rio Sur are better known for their restaurants, bars and nightlife than actual shopping. For that, I’d point people to Santa Fe or Oviedo. My point is that I don’t think Mayorca belongs in a list of the top 5 shopping malls in Medellín. Mayorca does have cheaper prices for clothes and shoes than you can find in the shops in El Poblado but you can find even cheaper prices in El Centro, like in the large Centro Comercial Palacio. Mayorca is an older mall that was built in 2002. It’s also kind of ugly being a high rise mall with something like 10 floors and nothing really special about it and I would put several malls ahead of it in a list of the top malls in Medellín. Mayorca is easy to get to being conveniently located next to the Itagüí metro station. But Puerta Del Norte that opened in 2008 is just as easy to get to located at metro station Niquía in the opposite direction. Puerta Del Norte is newer and larger than Mayorca and it also has a number of shops with inexpensive clothes and shoes. I personally prefer Puerta Del Norte over Mayorca. I would also put Premium Plaza and probably San Diego and Aves María malls ahead of Mayorca in my list of the top malls in Medellín. El Poblado looks to be overbuilt with malls and the other neighborhoods in Medellín have too few, that’s why the malls outside of El Poblado are normally much busier in my experience. Too many mall developers are chasing the higher incomes in El Poblado but more than 90% of the population of Medellín lives in other neighborhoods. I have lived in apartments in the El Poblado, Estadio and Belen neighborhoods in Medellín and my experience is that El Poblado has the highest prices for pretty much everything in the shops in that neighborhood. You really need to get out of Poblado to find better prices. Unicentro and Puerta del Norte are cool too. I’ve been to both. I will be considering all feedback when I review all these “best of” posts and write a new one with links to any revisions I make to past stories. So, you never know. Maybe Santa Fe, Oviedo or El Tesoro (or two of three, or all three) will be gone. Premium Plaza just missed the cut. I admit, it’s great! I am travelling and I need to replace by backpack, can you recommend a shopping centre to buy a new backpack? Can you recommend a good mall for family fun?